“Genotyping isn’t standard of care, so we don’t do it,” said the surgeon dismissively to me a week ago, as if I’d asked him to bleed my husband or feel his head bumps. Since the surgeon had just removed a foot of Larry’s colon, I stifled the urge to shout Gleevec! Avastin! Herceptin! I’d asked about testing the cancer cells for variants of well-studied oncogenes and tumor suppressor genes. The mutational state of tumor cells at the time of removal, especially given the rarity of the cancer’s origin – the appendix — might prove informative should further treatment become necessary, even if that’s not for many years. Ads for targeted treatments for cancer based on genetics are already common on TV, and cancer genomics is a major part of the Precision Medicine Initiative. In a paper published yesterday in Genome Medicine, researchers from the Icahn School of Medicine at Mount Sinai describe going beyond rounding-up-the-usual-suspects of oncogenes and tumor suppressors in existing test panels to include whole exomes, gene expression, copy number variation, and gene fusions in dissecting tumor cells. It’s a pilot study, on tumor cells from patients with various cancers, but in 42 of the 46 cases, the “integrated genomic profile” revealed gene variants that are associated with drug response and toxicity, or prognosis – a better success rate than commercially available targeted cancer panels. The findings changed treatment plans for some of the patients. “For patients battling cancer, it’s hard to put a price on information that may lead to more successful outcomes,” said Eric Schadt, PhD, founding director of the Icahn Institute for Genomics and Multiscale Biology. Larry is now the poster child for colonoscopy. He had the procedure at the end of April, an annual event due to a history of polyps. 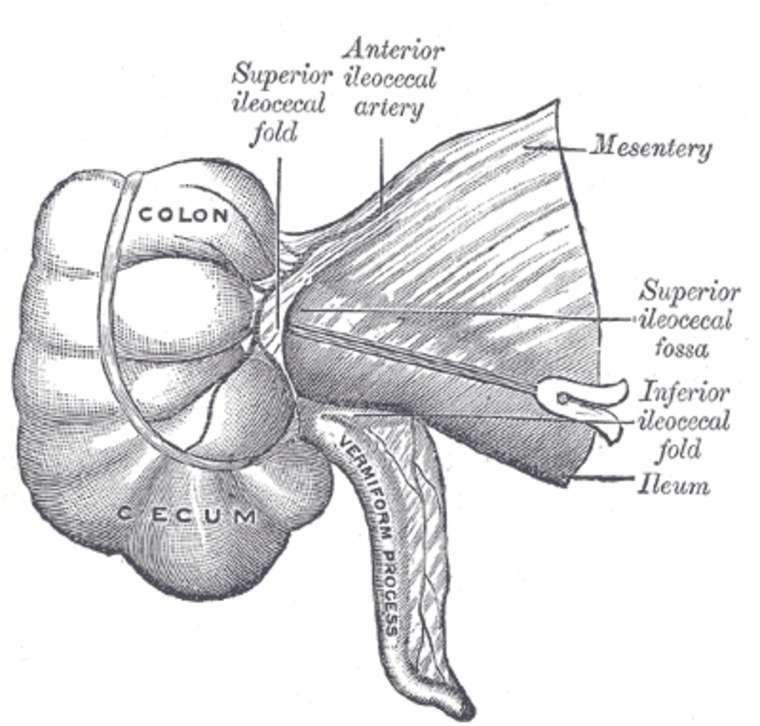 This time the test revealed, in addition to easily-removable polyps, a lesion where the appendix once was attached, before its supposed excision in 2009 (a third of it apparently left behind or regrown). A cancerous goblet cell of the appendix. The success stories of targeting cancer treatments have been accruing for years. Gleevec, developed for chronic myelogenous leukemia, is now used for several blood and bone marrow cancers. The breast cancer drug Herceptin is deployed against tumors of the stomach and junction between the esophagus and stomach. The anti-angiogenesis agent Avastin works for types of lung, kidney, ovarian, and brain cancers, and most recently the melanoma drug Zelboraf was found effective for non–small-cell lung cancer and two rare cancers. Each targets specific receptors that distinguish the cancer cells from surrounding healthy ones, either in type or abundance. Until last week, I’d never encountered outright dismissal of the value of considering cancer genetics. It made me ponder the sequence of professionals Larry and I have encountered so far on this new and unwanted journey. So much of it has been happenstance. On Friday the 13th, 4 days before Larry’s surgery, I got an email from Stephen Tsang, MD, PhD, from Columbia University Medical Center. We’d met about 5 years ago at the inaugural meeting of a rare disease organization. He was alerting me to his new publication, so I picked his brain about the cancer. Dr. Tsang immediately emailed 3 places that could test Larry’s tumor, as well as advice on which tests to do, in what sequence: whole exome and copy number variants, and if those are negative, then whole genome sequencing, of tumor cells plus a control sample to identify the backdrop of germinal (present in every cell, not just cancer cells) mutations. I chose Ambry Genetics because I know them from meetings. I filled out an online form, and a personal response came within an hour, from one of three PhD scientists who’d eventually communicate with me. She related the practical realities: no direct-to-consumer testing and insurance wouldn’t cover the cost – as I’d suspected. But they did offer, through a physician, a test called TumorNext that identifies 142 cancer genes plus copy number variants. I thought about genetic testing over the weekend, hesitant to mention it to Larry lest he think I was trying to turn him into a science experiment. But I talked to two friends who’ve had experience with cancer about DNA testing, and they instantly agreed it made sense. So on Monday, I broached the idea with Larry. He was all for it. By then things were moving rapidly, because the surgery was scheduled for Tuesday at 5 am. While Larry drank the Kool-Aid and Miralax cocktail of the prep, I tried to wrap up work on two books due in July so I could take time off. About mid-day, I panicked. What if the tumor sample would need to be frozen for a later DNA test? Was there time to navigate the impenetrable phone tree to tell the surgeon to do this? At literally the eleventh hour, nearing 5 pm on the east coast, I emailed west-coast Ambry again. And they immediately convened a meeting to discuss Larry’s case, reassured me that formalin-fixed paraffin-embedded samples were just fine for testing in the future, but told me that we couldn’t use their TumorNext test after all because it wasn’t yet approved in New York. Instead, they sent info on MSK-IMPACT Tumor Profiling from Memorial Sloan Kettering Cancer Center. I try to post here at DNA Science every Thursday, but thought I’d need time off for Larry’s surgery. During the trek from diagnosis to treatment, Hans Sollinger, MD, PhD, a surgeon at the University of Wisconsin, contacted me, after having his students read my book about gene therapy. Would I be interested in his work using gene therapy for type 1 diabetes? Of course the answer was yes, and the topic became my May 12 DNA Science post. We began emailing, and I mentioned Larry’s cancer. Dr. Sollinger helped me much more than supplying a blog topic. On May 10, he sent me “Goblet cell carcinoid tumors of the appendix: an overview” in the World Journal of Gastrointestinal Oncology. I appreciated the technical reference – over the past weeks, doctors and nurses have talked to Larry and me about “medicine” and “germs” as if we’re fourth-graders. From the article I learned that the mutational choreography that orchestrated the adenocarcinoid tumor inexplicably pushing its way into Larry’s ascending colon was quite different from hereditary nonpolyposis colorectal cancer (HNPCC), aka Lynch syndrome, the multi-gene condition tracked with frequent colonoscopies. Therefore, drugs recommended for HNPCC might not be appropriate. How could genetic information about the tumor cells at the current state of their evolution possibly hurt? Oncology has changed since my mother endured one useless chemo after another while battling metastatic breast cancer, a victim of the one-size-fits-all approach that was cancer treatment circa 2000. Dr. Sollinger went even farther than providing a blog idea and sending an informative article. We were emailing late into the night before Larry’s early morning surgery, my finding comfort in the opinion of a man who had performed more pancreatic islet cell transplants than anyone else on the planet, not to mention 3,000 or so kidney transplants. As midnight neared, he urged me to get some sleep. My husband would need me. The help from strangers continues. Just a few days ago, I discovered that the brother of an editor I work with on a cancer research website is a world expert on appendix cancer. And he’s going to help us navigate the next chapters, which will include genetic testing. For many cancers, the sequence of driver mutations is well known. Cancer can arise in an organ that is supposedly gone. Larry may have regrown an appendix that may have been cancerous 7 years ago; my 103-year-old grandfather regrew a once-cancerous prostate. My viewpoint is skewed by my immersion in DNA science, and reading medical journals like the NEJM that constantly cover how DNA analysis is impacting health care. But some physicians have yet to accept that profiling the somatic mutations that drive a cancer can inform clinical decision-making. Paternalism is alive and well in health care. Doctors reveal vital information in sanitized sound bytes, sometimes literally while on the move when doing rounds, and it takes an act of Congress, plus lots of faxing, to get a copy of a pathology report. Trying to obtain test results or getting specialists to talk to each other entails dealing with bottomless pits called “patient gateways,” a source of online obfuscation. Genetic testing companies are selling a product, if indirectly, but their staff scientists are great resources in explaining exactly what specific tests can and cannot reveal. Spending a week in the hospital was an eye-opener. The oversimplification bordering on condescension and lack of knowledge of the genetic underpinnings of disease was a tiny taste of what the rare disease families I know confront so often. We’ll probably invest in genetically profiling Larry’s errant cells, so maybe he will turn out to be a science project after all. But I think the science has come a long way since Steve Jobs and Christopher Hitchens had their cancer genomes sequenced, to no avail. At that time, 2011, it was too much information, too little too late. Genetic profiling for cancer may in fact not be standard of care just yet, but I think it is the future of medicine.